TIJUANA – In an effort to restore order after two riots, Baja California’s governor sacked the top staff of La Mesa State Penitentiary and asked the federal government to temporarily take over the administration of the volatile prison. On Thursday morning, more than 100 local, state and municipal police officers surrounded the damaged facility. About 200 family members, anxious for word on their loved ones inside, are being kept at least two blocks away. Previously, they were allowed to congregate just a few yards away from the walls. Authorities are now sharing with the crowd the names of prisoners who are not injured inside the prison. Also, about 20 vehicles carrying officials from the state department of health could be seen entering the facility Thursday morning and delivering medical supplies. Other vehicles with food were also seen inside the prison grounds. Wednesday’s disturbance – the second in four days – started in the women’s wing about 1 p.m. when about a dozen women went to the rooftop of the building in which they were housed. They shattered lights and shouted down to the throng on the sidewalk outside that they were being beaten, and that dead and injured inmates were inside. Then some dark smoke rose from the prison and gunshots resonated throughout the neighborhood surrounding the facility. Hundreds of family members who had been clustered outside the prison walls for days shouted and sobbed and at one point stampeded in panic. Concrete chunks were hurled into the prison and the windows of numerous cars parked nearby were shattered by falling debris. About three hours later, state officials claimed control of the 8,100-inmate penitentiary and began moving out prisoners accused of instigating the riots. The perimeter outside the prison was also secured. Later in the day, Gov. Jose Guadalupe Osuna Millan announced the replacement the head of the state prisons and the administrator of the La Mesa facility. Also, 200 male inmates and 50 female inmates, who authorities have identified as prisoners who incited the riot, have been transferred to other facilities, the governor announced in a statement. He also put the death toll for the two riots at 17. Other officials previously said 19 had been killed. Sunday’s riot, which lasted about 12 hours and left at least four people dead, may have been triggered by the death of an inmate during a confrontation with prison staff. Officials said Israel Marquez Blanco, 19, died during scuffle with prison guards during a routine contraband check Saturday morning, in which marijuana, heroin and cellular phones were confiscated. The U.S. Consulate in Tijuana reported Wednesday that there were 256 U.S. citizens in the prison population. Officials expressed “a high-confidence level” that no U.S. citizens are among the dead. TIJUANA – The once-chaotic scene around the La Mesa state penitentiary began to return to normal by Thursday night. A line of people that at one point stretched for seven blocks had dwindled to about 15 by 5 p.m. People in the line were relatives of inmates who were waiting to reach tables where they were given information about their loved ones and allowed to write messages to them. Around 5 p.m., police officers began to withdraw from streets adjacent to the prison and started removing yellow tape. Two men arrived at the prison and started painting parts of burned, damaged walls. Several trucks arrived with canned food. Inmates rioted on Sunday and Wednesday. The violence left at least 24 dead and dozens injured. Since Sunday, thousands of people had congregated on the streets next to the prison, demanding to know what had happened to their relatives inside. About 100 went on a rampage Wednesday evening, setting several fires and burning patrol cars before being arrested. By Thursday evening, blankets could be seen hanging from some windows, a sign that some inmates had been allowed to do their laundry. Baja California’s human rights director, however, warned that the La Mesa penitentiary, as well as the three other state prisons, remained dangerously overcrowded and that conditions that led to this week’s riots had not been addressed. Today (9/19/08) the U-T reported that Baja state officials “gave conflicting accounts yesterday of the total number of dead in the two riots.” It reported that the over-all toll came to 21, but another official stated that they counted 17 dead inside the facility – all prisoners: 13 showed signs of gunshots, the remainder were beaten or stabbed; 45 inmates were injured Wed, including guards, inmates and police. Sunday’s riot claimed 4 lives. Then the official death toll was put at 19 from the second riot. One US citizen was among the dead. 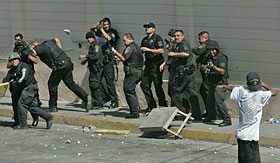 The Baja State Officials are never going to give the true number of dead in the riots. I have a loved one who is incarcerated there, and he told me exactly what happened. I feared for his life. Right after the first riot, I spoke to him on the phone while my family was outside the prison trying to see if he was injured. After the second riot I discovered there were more than 100 inmates killed by mexican authorities. U.S. citizens were also killed and injured. When everything settled down, visits were finally allowed and my family when and visit. The inmates said everything that had happened during the riots and I know mexican authorities are trying to hide the truth. Hiram Soto and Omar Millan Gonzales should get more info on this because the articles you wrote are are very far from what really happened. Newer Article: Can Obama’s Ground Game Beat GOP Vote-Robbing?